RYDER CUP legend Sam Torrance is hoping a new £900,000 indoor golf centre in Musselburgh can help bring through the Scottish game’s next wave of talent. Torrance was speaking as he visited the East Lothian town to open the start-of-the-art facility at Loretto School, where a golf programme has gone from strength to strength since it was launched 13 years ago. The new centre, which has been created on the site of an old swimming pool, will mainly be used by the school’s pupils, with 260 out of a total of 600 pupils now participating in golf each week. But, in a move that should be applauded, it will also be made available to the Scottish national squads and local community groups as well. “I’ve travelled all over the world, but I’d have to say that I believe this is a unique facility,” said Torrance, who holed the winning putt for Europe in the 1985 Ryder Cup at The Belfry before tasting victory at the same venue as captain in 2002. “I’ve certainly not seen anything like it and it’s great to see a school like Loretto pushing its golf programme as it’s the type of place the next champions will come from. The new centre will complement the outdoor facilities pupils use at Craigielaw, Archerfield Links and Royal Musselburgh. 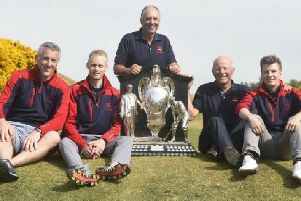 “We have the best playing and practice facilities we could possibly have,” said Loretto’s director of golf, Rick Valentine, who has been involved with the programme from the outset and now has three fellow PGA pros - Ryan Scott, Graham Mackay and Scott Smith - working alongside him.